You might have heard that good talent is getting harder to come by. The causes include broadening employment opportunities, more frequent job-hopping, growth in the freelance workforce, and worsening talent shortages in specific markets and disciplines. Not that everyone realises – in an earlier article, I revealed that ‘people risk’ is one of the most overlooked factors, with only 20% of the ASX 100 recognising that talent retention and attraction is a key business risk. Need help deciding on the right technology to automate your onboarding processes? 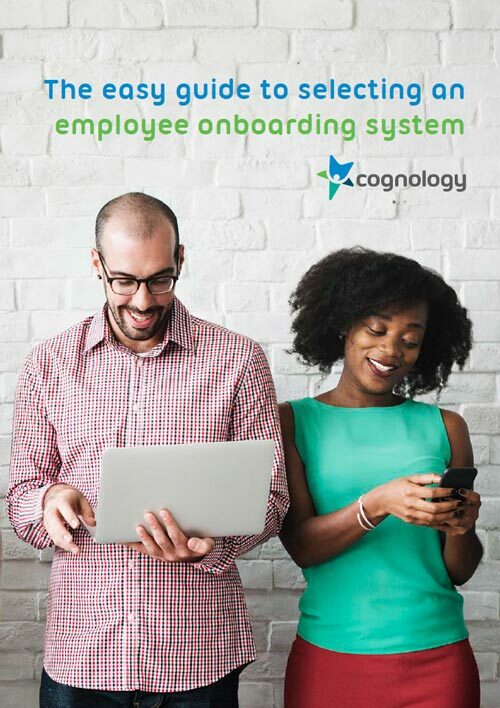 Download Cognology’s Easy Guide to Selecting an Employee Onboarding System. How could organisations best address this problem? Everything else being equal, it comes down to employee engagement, which in turn leans on whether employees feel respected, supported, recognised for their contributions and an integral part of the company culture. The onboarding phase, the importance of which I began to delve into in an earlier article, is particularly crucial. Ultimately, this is about adopting a certain attitude to your employees, and it begins with treating your candidates as you would your customers. What does it mean to treat candidates as customers? Before I get more abstract, it’s important to remember that your candidates are your customers – literally. According to a recent Candidate Experience report, more than 21% of candidates said that they were or have been customers to the places they applied for a job. The ease with which candidates can now put themselves forward for roles means that many job adverts attract hundreds of hopefuls – all about to have their first real and personal interaction with your organisation. They will form an opinion about your company based on the impression you convey, and it’s up to you to make sure it’s a positive one. Just as nurturing a favourable company brand is important, developing and maintaining a great employer brand has become critical to your company’s overall image in the market. Word travels fast these days, and bad news always wins the race. Top-notch transparency and crystal-clear, amiable communication are critical during the recruitment phase. But when it comes to building an outstanding employer brand, it’s onboarding new folks successfully that establishes an enviable company culture – one that will attract the best talent. I wrote earlier article about the importance of a structured, ongoing, relationship-focused onboarding program and its benefits to employee retention and productivity. That’s because after you select your candidate, they agree, and all the forms are signed, a critical judgment period begins. From this point until at least six months down the track, new recruits will make up their minds whether they’ve made the right decision or if they should prepare for a rapid abort. It’s common knowledge the damage a single bad online review can wreak, so why skimp when it comes to the new recruits? Offering expert after-sales support is a no-brainer, so it’s useful to think of onboarding similarly. When the product is trivial, buyer’s remorse might not lead to much; when it’s a person’s career choice they’re second guessing, any regret is likely to escalate into severe animosity. And it’s not just a matter of avoiding bad press – the best onboarding programs generate powerful and attractive company cultures that employees rave about. Word gets around – once your organisation is known as a great place to work, top talent will start to seek you. Forbes reported on the great PR benefit that emerges from a sophisticated onboarding program. Again, this is about building up an excellent reputation in terms of your employer brand. Ideally, you want your reputation for care and generosity to go viral through the professional and social networks of your talent pools. According to Forbes, tech giant Red Hat’s great onboarding program, which begins with a multi-day extravaganza of team building, matching mentors, and the final symbolic donning of their very own actual red fedora, has paid enviable dividends. The company has 4/5 stars on Glassdoor.com from past and current employees, won Computerworld’s coveted ‘Top 100 Places to Work’ award and was recognised by Forbes as one of ‘America’s 200 Best Small Companies’. It’s lauded for its workplace flexibility, culture, the quality of its employees, and its challenging, interesting work. With increasing visibility of employer brand through sites like Glassdoor and LinkedIn, candidates have easy access to the resources needed to broadly survey the employer landscape. And with company success strongly correlated with both the calibre of employees and employee engagement, this is absolutely the time to start thinking about these aspects – if you haven’t already. Critical first impressions are made during the early days, so excellent onboarding is a must, and I’ll be taking a closer look at how to do employee onboarding the right way in a future blog – stay tuned! Reduce new hire turnover in your organisation. See an Onboarding system your new hires will love.